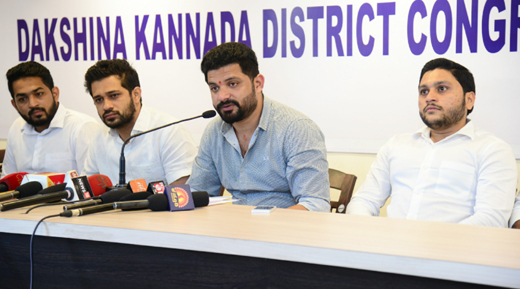 Mangaluru, Sep 4,2017: Addressing the media at the District Congress office, Mr. Mithun Rai, the president of the District Youth Congress said that the BJP Yuva Morcha has no ‘morality’ to hold the ‘Mangaluru Chalo’ bike rally on September 4, 2017. He said that the main reason for the rally was merely to drum up support to ban the Popular Front of India, hand over the murder cases of Hindu activists to the CBI and to demand the resignation of Minister, Ramanath Rai. Mithun also said that the members of Bajrang Dal and Hindu Jagarana Vedike are also involved in many murder cases. He said that the PFI, HJV and Bajrang Dal are firstly communal organizations. “If they want to ban PFI let them also demand to ban Bajrang Dal and HJV,” he said. Mithun Rai further added that for peace to prevail, both the communal organisations would need to be banned. DK is known as an education hub and is the fast growing district but for some years, due to communal violence in the area, many multinational companies have refused to set up office in Mangaluru. Supporting Mr Ramanath Rai, Mithun said that the seasoned politician had no corruption or land scam accusations against him. “On what grounds is Harish Poonja demanding his resignation?”, he demanded. The press meet also saw Mr. Rai attack the BJP Yuva Morcha District President Harish Poonja over remarks the latter had made regarding Mr. Ramanath Rai being a sort of ‘Hitler’ figure. Vice President of District Youth Congress Lukman Bantwal, Prasad Malli, Suhail Kandak, Utham Alva, Shoib, Varun Ambat and others were also present.